One of the Program Managers for the Xna Framework recently started his first blog. Unless you have the main RSS feed of this site subscribed, you probably didn’t notice his first post, which talks about a lot. You may have also seen the ‘official’ press release announcing the Xna Framework. If you haven’t read Al’s post yet, I suggest you go do that first. It’s ok, i’ll wait for you to get done..
Great, you’re back! Anyway, there’s so much stuff I want to talk about and say, but I’m probably going to start rambling and forget mentioning things.. C’est la vie.. So anyways, like I mentioned last week, I’ve moved over to the XBox team and the Xna team specifically. If you’re @ GDC this week, you might have the chance to see some of the demos we have written entirely in managed code running on both Windows as well as the XBox 360. People have been asking me for what seems like forever if there would be managed support for the Xbox, and I guess we’ve finally answered that. Of course, i’ve also had people tell me numerous times over the last 3 to 4 years that it is essentially impossible to write a game in managed code. I have no idea why people think that, but obviously we disagree, and our demo’s are starting to show that (even considering the early nature of the work we’ve done). We’re working feverishly to get a preview of the Xna Framework out as soon as possible, and I’m quite excited about the work we’re doing, and the excitement people will have when they see it. It’s also quite refreshing to have an entire team supporting in these efforts. I look forward to talking more about some of the exciting things we’re doing in the (hopefully not too distant) future. Lots of changes been going on over here recently which have been keeping me quite busy (well, more busy than usual). I’ve recently switched groups over to the Xbox team (and the XNA team specifically), and I’m quite excited about the stuff we’re working on. Don’t think this means I’ve “forgotten” about MDX though, believe me, I haven’t. While i’m thinking about it though, it would be great if the people who are using MDX2 right now could contact me and give me some ideas on what you’re working on, and when you hope to ship. I may not be able to get a chance to reply to everyone, but I’ll read them all. This is quite the ‘exciting’ (yet overwhelmingly busy) time for me.. Like I said a few blog posts ago, we’re starting the revolution of managed code in gaming. Author MillerPosted on March 14, 2006 Categories Managed DirectX, XNALeave a comment on Busy busy busy!! Joe from TrayGames contacted me earlier and apparently they have a public beta available now. You can read more about it on Zman’s site, or here. 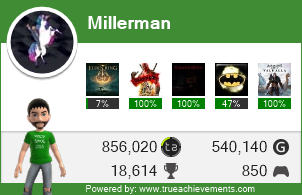 Author MillerPosted on March 9, 2006 Categories Managed DirectXLeave a comment on TrayGames..